Want to add an unusual and truly “one of a kind” specimen tree to your home landscape? If so, the ginkgo tree is an excellent choice. The ginkgo tree (Ginkgo biloba), or maidenhair tree as it is sometimes called, is not native to North America at all but actually occurs as a native plant in China, where it is widely cultivated. It has been imported into the United States and is now a popular ornamental “street tree,” often planted in urban settings and especially favored by municipalities because of the tree’s tolerance to smoke and pollution. In addition, the fact that the ginkgo tree is generally unaffected by diseases and pests and is tolerant of a variety of growing conditions adds to its desirability in the home landscape or in commercial and industrial settings. Now that we know a little bit about the general history and horticultural usefulness of the ginkgo biloba, let’s take a look at some things that make it a distinctive and truly unusual specimen in the world of ornamental trees. The leaves of the ginkgo are like the leaves of no other tree. They are fan-shaped, the veination is a series of radial lines running from the base to the outer edges, and those outer edges are divided into two lobes. 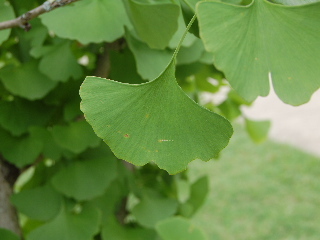 The tree’s scientific name, Ginkgo biloba, accurately describes the leaf form, since “biloba” actually means “two lobes.” The leaves occur at the ends of spur-like shoots or spirally along the twigs, giving the appearance of the leaves “hugging” the limbs. The branches of the tree are somewhat stiffly diagonal and uplifted, rather than spreading or bunching into a rounded crown. The leaf-habit and branching-habit taken together give the ginkgo tree a slender, open, almost spire-like appearance. 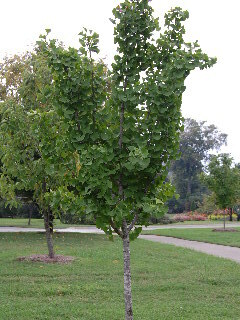 This growth habit provides filtered shade and produces the distinctively recognizable form of the ginkgo in the landscape. Another unusual feature of those already unique leaves is the fact that they turn to a beautiful golden yellow color in the fall, and all of them drop from the tree at essentially the same time, making clean up a one-time experience every autumn! This golden leaf coloring makes a striking appearance against the red brick backdrop of a typical home or mirrored in the glass front reflection of industrial or office buildings. The ginkgo biloba tree is a rather slow-growing species. It is usually seen in the landscape reaching heights of 25 to 40 feet, although it can grow up to 80 feet tall over a period of many years. The tree seems to do just as well in growing conditions of partial shade as it does in full sun. About the only objectionable aspect of the ginkgo tree is that the female of the species produces a plum-like fruit about one inch in diameter, which has a rather foul-smelling odor as it disintegrates. This seems a rather minor inconvenience and is greatly outweighed by the beauty and uniqueness of this remarkable tree. Look for this tree planted in park settings or in progressive municipal areas along streets and sidewalks. Or, best of all, be bold yourself and add the beautiful ginkgo tree to your home landscape!